Firewood selection and gathering. There is only one type of wood which is acceptable for building a low-impact campfire dead and downed wood. Do notbreak dead branches off any trees, live or dead. Broken branch stubs and scars are obvious, long lasting impacts. The size of firewood is critical to building a Leave No Trace fire. Firewood should be no larger in diameter than an adult’s wrist so it will burn completely and can be broken by hand. Collect loose sticks and branches from the ground. Firewood should be gathered away from camp so the im mediate vicinity does not look unnaturally barren. Take the time to walk 15 or 20 minutes away, or if you’re traveling by canoe, paddle a good distance from camp and then begin to gather the wood. Pick up the wood as you are walking so that no single place becomes denuded. In all campfire situations, the use of saws, axes and hatchets is unnecessary. Sawing and chopping leave more impact and further detract from the naturalness of the area. Firewood can easily be gathered by hand. Care and feeding of your fire. Keep the wood in its natural lengths. When feeding the fire, break the wood into burnable lengths as needed. If there is any unburned wood left when breaking camp it can be scattered around the forest and will blend in naturally. All firewood should be burned down to white ash or very small coals. Doing this may require some extra time, but is a significant step in minimizing the impact of the fire. All fires should be cleaned up before breaking camp. Fires in high-use areas. In high-use areas, where impacts should be concentrated, campfires can be built in existing fire rings if there is sufficient firewood. In these sites, it is almost certain that there will be a fire ring present when you arrive. In popular campsites encourage others to use the same fire ring by leaving it clean. Remove any residual trash and burn all wood completely to ashes. When completely out, crush any cooled charcoal and scatter the material over a large area away from camp. This helps avoid the proliferation of multiple fire rings in a popular site. Fires in pristine areas. In remote or pristine areas,itispossible to enjoy a fire and Leave No Trace that it was ever there. The developmentof techniques for these types of fires has evolved over the years to the point that there are some very practical alternatives to the traditional fire ring. The heat from fires or stoves can cause impact, but so, too, can the concentrated trampling of people cooking or socializing. Take care to select a durable site for any use of fire. The mound fire An innovative method for building a Leave No Trace fire is the mound fire. Mound fires can be built virtually anywhere and with simple tools: a garden trowel, large stuff sack and a ground cloth. Construction of this type of fire begins by first locating a ready source of mineral soil, sand or gravel. Gather the mineral soil from a spot which is already disturbed by natural forces and where the impact of digging and collecting the mineral soil will not damage live vegetation. Sand or small gravel collected from stream beds or lakeshores provide examples. With the garden trowel and stuff sack (turned inside out to keep the inside of the bag from getting dirtyj, carry a load of mineral soil to the fire site. Lay a tarp or ground cloth on the fire site and then spread the soil into a circular, flat-topped mound about 6 -8 inches thick. The ground cloth is important only in that it makes cleaning up the fire much easier and adds some degree of flexibility to the system. The thickness of the mound is critical for insulating the surface underneath from the heat of the fire. This will also prevent the ground cloth from melting. The circumference of the mound should be larger than the size of the fire to allow for the inevitable spreading of coals. It may take more than one bag of soil to make an adequate mound. After the fire is out and you are ready to break camp, the little bit of ash and coals which are left can be scattered away from camp and the mineral soil returned to the source. The advantage of the mound fire is that it can be built on flat exposed bedrock or on an organic surface such as litter, duff or grass. Even with a thick mound, sometimes the heat generated can be enough to kill grass or other plants, but it is only temporary and does not sterilize the soil the way a traditional fire can. Portable fire pans: Another alternative is the portable fire pan, a metal tray with rigid sides at least three inches high. Fire pans were first used by river runners to minimize the impact of their fires, but they are becoming increasingly popular with backpackers and horse packers. 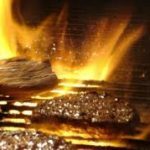 Metal oil drain pans and backyard barbeque grills make effective and inexpensive fire pans, though a few outdoor companies are beginning to market lightweight versions. 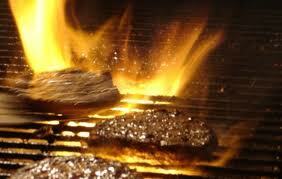 When using a fire pan, elevate the pan or line it with mineral soil so the heat does not scorch the ground.